This Upscale Dining Deals feature is our hunt for secret deals that fine-dining restaurants run on slow nights (usually Sundays and Mondays) when they need to fill seats. In all my wandering around town in search of Upscale Dining Deals (I have a lot of free time on my hands), I didn’t expect that hunt to lead to the Four Seasons Hotel, where a room with a view of Elliott Bay (room, not a suite, mind you) can run $969 per night. But I can eat here among the new money Seattle set on Sundays and Mondays — relatively cheaply; $45 gets me dinner for two, a couple of pasta bowls and a bottle of wine at Goldfinch Tavern, the Ethan Stowell restaurant inside this five-star hotel near Pike Place. It’s a good deal when you consider pasta entrees range from $26-$35 each on other nights. Dusk is the best time to dine here, when the window shades are lifted to reveal a postcard view of the Olympics and beyond. And the lighting is turned down romantically just to the point where I can’t see the prices on the menu. But hey, come for the $45 deal and you won’t even need to see a menu. The deal: The dinner special includes a bottle of Ross Andrew’s cabernet sauvignon or pinot gris. The cab with dark fruit and cacao notes is better than all the table reds I’ve sampled in these Upscale Dining Deal meals. The white wine, with its mineral and floral notes, is even better, though this refreshing pinot gris from the Celilo Vineyard can’t stand up to some of the rich entrees. 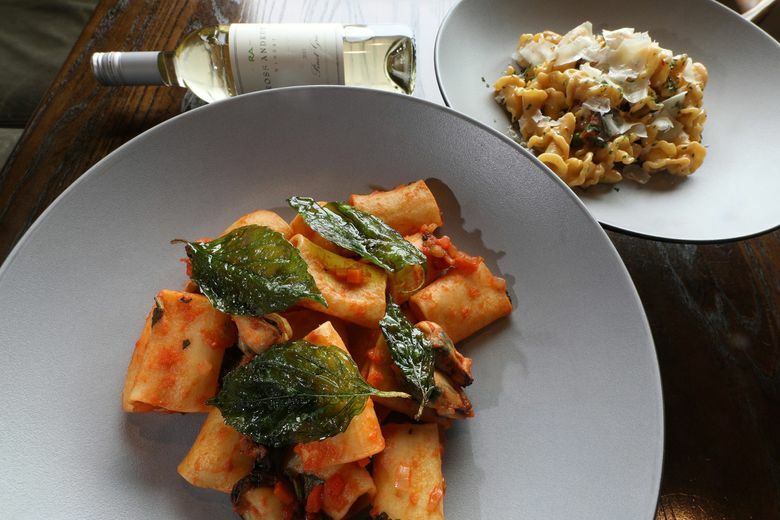 The pastas — one meat and a vegetarian option — rotate weekly at the whim of the kitchen. The common denominator is that all the noodles, made fresh every morning, are served al dente, firm and chewy. Best was the ruffled campanelle pasta, thick and bouncy in texture, each coated in a rich cream sauce and cut with sun-dried tomatoes and complemented by the pop of English peas. Also memorable was the bright, sweet-tart tomato sauce, not thickened or adulterated with much — and better for it — paired with tube-shaped pasta, plump mussels and fried basil leaves. If you’re lucky, the beef-lamb Bolognese will be served — a spicy, meaty bite tempered with dollops of fresh ricotta and Mama Lil’s peppers. Not every dish worked. The burrata cheese and globs of extra-virgin olive oil were meant to fortify the vegetarian pappardelle pasta, but it wasn’t a coherent dish. The pesto was bland. The toasted pine nuts and charred cherry tomatoes didn’t cling to the oily, slick pasta and required a spoon to eat as a separate bite. Note that the $45 dinner special (only on Sundays and Mondays) runs until April 1, then it goes on hiatus during Seattle Restaurant Week before returning on April 21. The $45 deal will likely end when the tourist season picks up for the hotel. Call ahead to make sure the $45 is still available in May.